"I've had enough of making people laugh, I want to make them seek." Fox Searchlight has debuted the new full-length trailer for the film Goodbye Christopher Robin, telling the true story of beloved children's author A. A. Milne, as played by Domhnall Gleeson in the film. This seems like a nice bit of happiness in the midst of all the darkness these days. 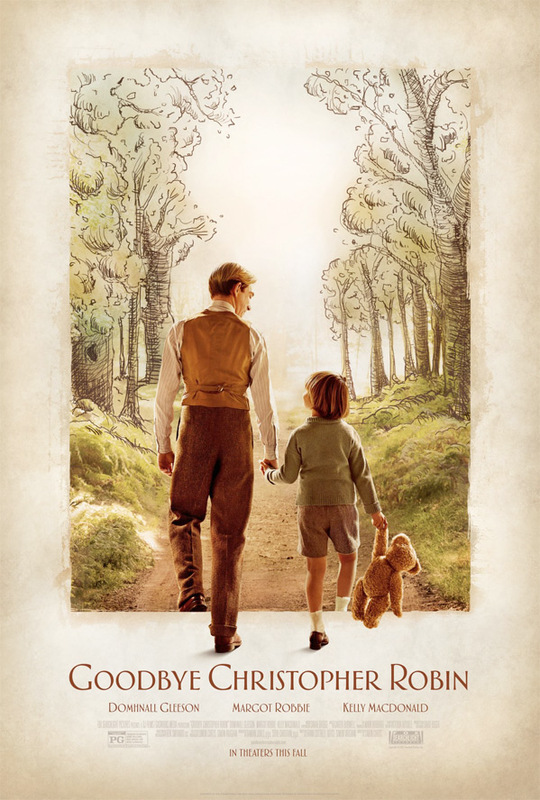 Set in England in the early 1900s, the story is all about how Milne came up with Winnie the Pooh, inspired by his son Christopher Robin and his stuffed animals. Along with the very talented Domhnall Gleeson, the cast includes Margot Robbie as Daphne Milne, Will Tilston as C.R., plus Kelly Macdonald, Phoebe Waller-Bridge, and Stephen Campbell Moore. This looks quite lovely and uplifting, with plenty of heart and humor and good vibes. Should be a nice film to watch this fall. You can still watch the first teaser trailer for Goodbye Christopher Robin here, to see even more footage. A rare glimpse into the relationship between beloved children's author A. A. Milne (Domhnall Gleeson) and his son Christopher Robin, whose toys inspired the magical world of Winnie the Pooh. Along with his mother Daphne (Margot Robbie), and his nanny Olive (Kelly Macdonald), Christopher Robin and his family are swept up in the international success of the books; the enchanting tales bringing hope and comfort to England after the First World War. But with the eyes of the world on Christopher Robin, what will the cost be to the family? Goodbye Christopher Robin is directed by English filmmaker Simon Curtis, of the films My Week with Marilyn and Woman in Gold previously, as well as episodes of "Cranford" and other TV work. The screenplay is co-written by Frank Cottrell Boyce and Simon Vaughan. Fox Searchlight releases Goodbye Christopher Robin in select theaters starting on October 13th this fall. Who's interested?